Agents often need specific disclosures signed before potential buyers can see a listing, or sometimes agents want to show the floor plan of a listing or attach more photos. This is often a tedious process - you have to find the showing agent's email address, find the documents or photos to attach, then send the email. 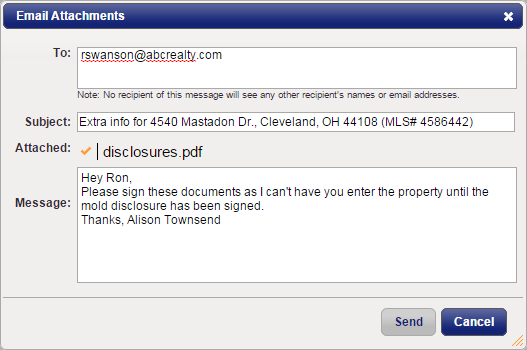 ShowingTime has automated this process by allowing agents to easily attach documents or photos. 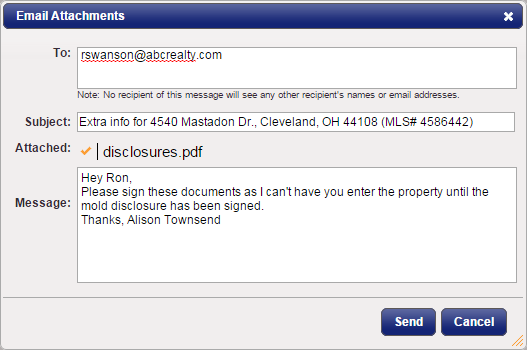 Every time an agent schedules on that listing, they will automatically be emailed those documents. ShowingTime enables you to attach multiple documents if needed. Attachments must be in .PDF, .JPG, .GIF or .PNG formats (20MB max per file). Start by selecting Listing Setup from the side menu. Then select Listing Setup from the sub-menu. Find the listing you want to update with attachments. 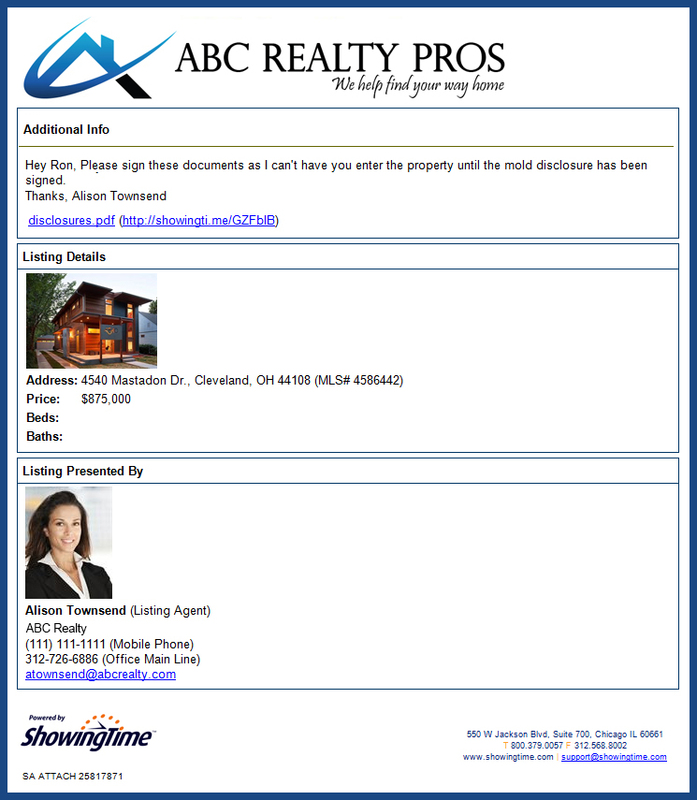 On the left side of the listing worksheet, underneath your listing's photo, select Attachments. From the sub-menu, select Add / Remove. Navigate to find the file you want to attach. Attached documents will be uploaded once selected. If a document needs to be removed, click on the orange X next to that item. When finished click Done. 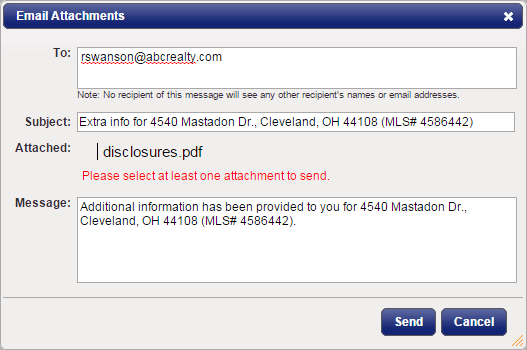 Now each time an agent schedules on this listing, your attachments will be sent automatically. Select the Send In Email sub-menu option from the Attachments menu. 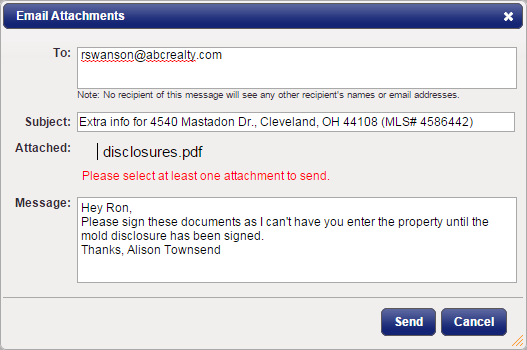 Enter the agent email address where you want to send the attachments. Edit the Subject and Message fields if desired. All attachments with a check mark next to them will be sent in this email. Note: All attachments sent to the showing agent via this method will be sent on your behalf (as a Listing Agent, from your email address).